+ All numbers are from the presentation made Tuesday. APD says they're based on three years of reports, from October 1, 2011-September 30, 2014. + From 2011 October to 2014 September there were 25,108 traffic tickets written, according to APD. Of those, 15 percent were written at top-30 crash intersections. + A handful of intersections that could have made the list were excluded, for a variety of reasons. Among them: The signal equipment currently at the intersection won't work with the red light camera technology, or the city doesn't control the intersection (the state does). Also: The Washington Ave/Fuller Road intersection -- which Cox said has been a problem intersection -- was excluded because it's now a roundabout. + About traffic tickets: Where tickets are given out is, in part, a function of where police are set up to ticket people. Cox said the configuration of some intersections makes it very difficult to set up a patrol car for traffic enforcement, so the number of tickets issued at some intersections isn't necessarily a good guide for how much red light running (or whatever violation) is occurring there. + Quick review of the basics: The Common Council passed an ordinance allowing 20 intersections to get red light cameras. Violations will be $50, no points. The city budget includes a line for $2 million in revenue from the cameras. Here's is much more about the background. + One of the public comments during the Tuesday afternoon session was about stretches -- such as Western Ave from Allen St to the city line -- that don't necessarily show up in the crash reports, but anecdotally have a lot of red light running. We asked Cox whether some of these intersections could end up being included in the final 20, and he said it's possible public input and further study could make that happen. But it's also possible that a closer look will reveal that the problems at these intersections aren't necessarily about red light running, but rather some other issue like speeding. And that can be addressed some other way. + One of the those ways: Shifting enforcement resources freed up by red light cameras to better cover other intersections for problems like speeding. Cox: "So, some of the speeding issues we might be able to spend more time addressing and actually making a difference in those areas if we have red light cameras system on these other 20 intersections. So it's almost a multiplying force for us to be able to do that kind of concentrated effort on enforcement." + Cox has mentioned the need for driver education about red light cameras in earlier forums and he reiterated it again Tuesday: "Education is the key to everything we're going to do." He said the plan is to start the education campaigns about the cameras before the devices are installed. "There are valid concerns, no doubt about it. We're trying to address these valid concerns." + In the lead up to the Common Council vote on red light cameras, there were some vocal skeptics of the idea. And Cox acknowledged that Tuesday: "There are valid concerns, no doubt about it. We're trying to address these valid concerns." Cox said the effort to be transparent about how the intersections are being selected is part of that. Cox also reiterated that he views this project as a public safety measure, not about revenue. + One of the big concerns raised by skeptics has been that, to put it bluntly, red light camera companies can't be trusted to play everything fair and square. On Tuesday Cox reiterated that the city would not allow the red light camera contractor to control the length of yellow lights (currently 3 seconds at many intersections, with a goal to increase it to 4 seconds), nor would it allow the contractor to solely pick the locations. As Cox laid it out, the idea is to hand the list of intersections to the contractor and, unless there's some technical issue that prevents the intersection from being used, stick to the city's list. + The Madison Ave Road Diet came up during Cox's presentation. And he indicated the city is looking forward to the plan to "calm" traffic on that street as a test of the idea -- and if it's successful, it could be spread to other corridors such as Western and Washington. "So, if there are other issues going on at that intersection -- or it has nothing to do with the red light system there -- then we fix it other ways," Cox said. "Because this is really about public safety. This is about fixing the issues at that intersection. So if it's an engineering issue, or environmental issue, let's fix that. ... So it really has to be a deeper dig -- it can't be just raw data." + We get the sense that the city is using the data review for red light cameras as opportunity to more closely examine data for intersections generally. And as Cox highlighted during his talk Tuesday, that could lead the city to better understanding why there are problems at some intersections and explore remedies that aren't red light cameras -- like changing the way an intersection is engineered. + This closer look at traffic incident data and intersections sounds like a good idea -- so why hasn't it already happened? We asked Cox about that. His response: "It's not that we weren't doing it, because we were doing it. It's just that we probably weren't as focused we should be on it." He said that listening to the public over the last five years has emphasized that traffic safety is a bigger issue for people than the department might have realized. That's now changed -- Cox said traffic safety is now one of the four main pillars of the APD's strategic plan. "The beautiful thing about having the community policing philosophy -- and actually carrying through on it -- is that you listen to the community and you change what you're doing, if it's appropriate. If you need to make a change, you make a change. And this has helped us make a change." + As mentioned before, Cox said he thinks the 20 intersections can be selected by the end of December. + The city is currently working on the request for proposals that it will issue to red light camera contractors. In the lead up to the red light camera vote, skeptics argued that many municipalities end up getting themselves into burdensome contracts for these systems. So the RFP -- and the potential contract -- are worth watching. I may have missed this in an earlier report, how much are these going to cost to roll out? Also, have they looked at if the accidents were because of light violations versus poorly designed intersections? $2,000,000 in revenue seems a stretch with each violation a $50 fine. 40,000 tickets seems like alot. If it's really about public safety and not about another way to make money, how about donate the $2M to charity each year. How dumb to they think people are. Why can't this be about public safety AND making some money? I'd rather have 2 million coming from drivers who are endangering others than from the pockets of homeowners. As one who both drives and walks I say- bring 'em on! - This is about public safety, but the tickets will not affect the driving record and are the equivalent to a parking violation... not a bad deal to punish individuals who are a threat to public safety... Or is it not really about public safety? - Every time the City of Albany creates one more rule to make city life unbearable, it shoots itself in the foot. While another hispter moves into a Center Square loft, three families walk away. Good luck. Bock, have you seen how many people run red lights in the city? I could believe the number to be an underestimate. Pete, the city needs money. And better public safety. Two birds. One stone. No problem. @Pete, for one, red light cameras don't grow on trees (and come to think of it, neither does money), so the revenue raised has to support the costs of running them. Two, the revenue will be plugged towards projects that enhance the safety of Albany's commuting infrastructure...that said, the language is pretty broad on what "improving safety" is, and could in theory go towards basic infrastructure maintenance, like filling in pot holes, rather than projects that more holistically improve the safety of the roads for autos, peds, and bikers (which is the intent of the law, but you know how those things go). Maria - because you cannot have the cake and eat it too. At some point, probably a few months, if not weeks after cameras are installed, city will have to choose whether this is about safety - and it is perfectly OK that people became aware of those cameras and no longer get tickets; or this is about money, and safety has to be sacrificed to increase number of violations while bills for camera installation and service keep coming. By the way, what would you personally choose - safety or cash? Too bad this won't also catch the elitist cyclists who do not obey traffic laws. @Maria - This was sold to the people as a way to improve public safety, not as another way to fill the coffers. Let's not blow smoke here. It was about another revenue source. @JayK - Again, why act like it's about public safety when it's about money? @Rich - I know they don't grow on trees, and they also aren't a required element of a city either. Since they insisted on having them, then they should use the revenues to pay for the red light camera running costs, and then donate the rest to charity. Again.. public safety is the top priority here, right? It just bothers me that they won't just come out and say they wanted another revenue source, and this is their answer. Joe A., Albany's population is growing. The projected revenues seem a bit insane to me. Is the expectation that this is just pay to play, or pay to run lights? Will we decide that it's okay to threaten people as long as you pay a fine and don't actually strike them? That's kinda what this is. That said, note that the city of Philadelphia, with 1.5 million people (little bit more than Albany), reported for 2012 that it had 108 cameras, $100 tickets, and brought in $10 million in revenues (with, somehow, $7 million in expenses). So it seems like you Albanians are gonna have to REALLY step up your red-light-ignoring if a city with 1/15th the population will bring in 1/5th the revenue. Drive like hell! When the lights are upgraded to allow for them to put redlight cameras in, does anyone think they will do anything to change the timing to let traffic flow properly? Wow, so much cynicism and skepticism out there! I'm with Maria! The red light runners will get repeatedly slapped on the wrist, the city will get a nice chunk of cash and I'll feel more confident crossing the street. If somehow everyone magically "wises up" and the program stops generating cash, common sense tells me they'll just shut it down. The only group(s) that favor red-light cameras is the government for the revenue. It's disgusting. Red-light cameras have been used over the decades and they are just a money grab. They've been proven to not increase safety and there are superior alternatives to reduce intersection accidents. Shame on the Albany government. I totally agree with Maria, as someone who's lived, walked and driven in Pine Hills I've seen way to many people blow through red lights. I've had people pass me while I was stopped at a light so that they can run it! Question: how can I raise revenues and claim that I didn't raise taxes? Answer: you pick something, anything, and fine it, ticket it, license it, register it, fee it, surcharge it... and spin it. Since the above strategy always only targets one group of people, there is no defense against it. The focus is not on the solution, but on the punishment, and the righteous Puritans will always be on the side of punishment, whether it makes sense or not. @Jeremy I'd heard they were considering raising the yellow light time from 3 seconds to 4 at some intersections. Does it make sense to actually publicize which lights will have the cameras? Won't that allow drivers to blow through the other lights with impunity? If this is about public safety, I'd rather drivers not be sure which lights have the cameras. @chrisck -- Unfortunately, Waze provides crowd-sourced red light camera information already, so even if the city doesn't publicize it, the information gets out there. Could we use some of the revenue to modernize the timing of the lights for a better flow of traffic? It is frustrating to drive down the main corridors and have your light turn green and drive a block and stop at a red light, go a block and stop, go a block and stop at an intersection with no traffic crossing. 3. The left turn bay and the straight-forward lane share the same signal head. They should have separate signal heads. One lane gets its own isolated signal head. Combination left/straight heads are cheaper for the NYDOT to deploy but the traffic engineers know it confuses drivers. 4. The NYDOT yellow light formula shorts the yellow light by up to 4 seconds for turning movements and for approaches that have side-streets and/or business entrances close by the intersection. The formula (a federal standard) provides the yellow time for a driver (once he cannot stop) to reach the intersection on the precondition he proceed at the speed limit or more. (Speed limit or more: this is the reason why we beat the light. It is an engineering mandate.) Albany seeks to exploit the bad physics of the standard. Albany seeks to trap drivers by creating an ordinance that expects drivers to break the unbreakable of physics. You'll find that every dangerous intersection will have engineers failures like this one. Instead of fixing the engineering, Albany will profit from the errors. 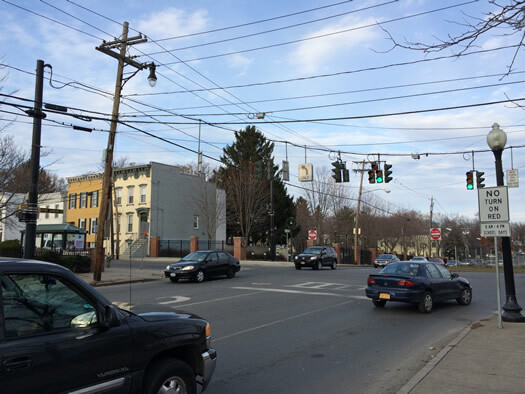 Albany and NYDOT traffic engineers will never confess to their failures even though they are the guilty party. A confession means the ruination of their careers. I will be timing yellow lights at these intersections and God help City of Albany of they are less than DOT standard! Brian, thank you for the additional information that you provide. Among other discussions now taking place around the role of police forces, I should add that our police forces have lost sight of their mission. In many jurisdictions, they are essentially tax collectors, charged with "enforcing" speed traps, line markings that narrow lanes, stop signs poorly placed (some hidden from view), and other tricks of the taxation trade. There are countless examples of this shameless use of law enforcement to supplement tax levies., while also fattening the bank accounts of attorneys. @JayK: yes, you're right. It grew by 3,000 people in 10 years (or an average of 300 per year). Careful where you're gonna put all of those people. Families that move in and buy homes are the ones that matter for the city. I don't see that happening. Albany is working on traffic flow. Read about it here. Unless I am mistaken, the red light cameras will be installed and maintained by a private contractor who will pay for maintenance. The private contractor collects the fines, deducts operating costs and gives what remains to the City. The $2M projected revenue is the projected net revenue to the City. The total collections are projected to be higher. The contractors do make money, but so does the City. I don't think the City can lose money on the deal, I think it is the contractor that would be at risk if by some miracle everyone stopped running red lights. It isn't without problems. Many cities have tried it and stopped. But I am on board to give it a try. We don't want to pay to have enough officers to stop all or even a material portion of the traffic infractions. Feels to me like drivers here blast through stop signs and red lights and speed with impunity. A real wild west feel. I don't care for it. I don't fell safe. Joe, setting aside the fact that I do see that happening, all new residents matter for the city.